This is Rebecca's debut show with Theatre in the Heights! Thank you to Candi for the opportunity to work with such a lovely cast and crew and special shout-out to our stage manager, Tyler Anderson, for bringing this opportunity to my attention. Education: Certificate of Completion, PCPA (Santa Maria). 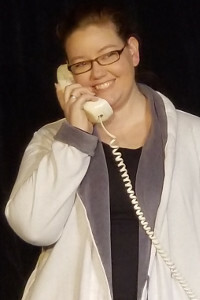 A.A. - Theater Arts, Acting, American River College (Sacramento). B.F.A. - Acting, UC Santa Barbara (Santa Barbara). Acting credits include: 25th Annual Putnam County Spelling Bee -Olive/Schwartzy/Marcy u/s and The Spitfire Grill - Percy/Shelby u/s (both PCPA Theaterfest), Dirty Rotten Scoundrels - Maid/Servant (Sacramento Music Circus), Macbeth - Hecate, Top Girls - Isabella Bird/Joyce/Mrs. Kidd, A Midsummer Night's Dream - Bottom, The Importance of Being Earnest - Lady Bracknell (all UC Santa Barbara), Hamlet - Ophelia/Osric (Imprinity Theatre).